change forever the way you look at deadbolts. Door Frame Reinforcer: All B500 Series deadbolt locks are furnished standard with the metal dust box reinforcer. This unit significantly strengthens a wood jamb against "kick-in" attack and greatly increases the security effectiveness of the lock. The reinforcer is concealed under the strike and is deeply anchored to the jamb with three 3" (76 mm) long screws. 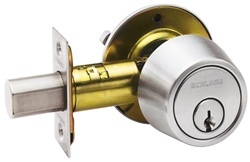 * Applications: Auxiliary and primary locking for commercial and residential buildings. B500 Series locks are designed to meet various security door preparations and functional requirements determined by local codes and life safety regulations. * Certifications: ANSI A156.5, 2001, Grade 2. Available UL Listed for three-hour fire door. * Exposed Trim: Wrought brass or bronze, reinforced with steel security insert. * Keying: 6-pin tumbler standard with two keys per lock. Stock locks are keyed 5. * Door range: 1-3/8" to 1-3/4" thick standard. Available for over 1-3/4" to 2-1/4" and over 2-1/4' to 4" assembled to order. * Backset: 2-3/8" or 2-3/4" adjustable backset standard. * Deadbolts and Strikes: B500 Series deadbolts and strikes have brass bronze or steel faceplates, furnished in compatible lock trim finishes. * Deadbolts: 1" x 2-1/4" square corner. 1" throw standard. * Strikes: Square corner 1-1/8" x 2-3/4" strike, no lip, furnished with metal dust box standard. * Adapter Rings: Trim ring with anti-pry shield standard, 2-1/2" outer diameter. Removable to fit 1-1/2" crossbore door preps.